Rosemary Chandler, 94, of Connersville, went home to be with the Lord on Monday, January 28, 2019, at Heritage House of Connersville. One of seven children of Harold and Mary Thacker Goodall, Rosemary was born in Huntington, West Virginia on January 19, 1925. On March 15, 1946, Rosemary married Kenneth W. Chandler, Pastor of First Baptist Church of Connersville for over 25 years. Mr. Chandler passed away on May 8, 1998. 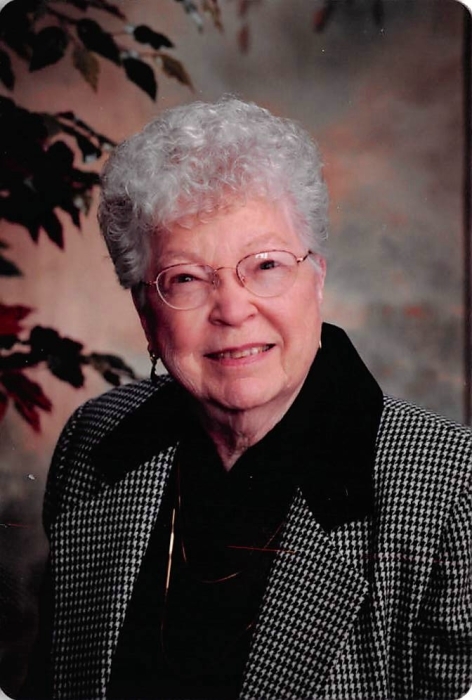 Following her graduation from Huntington East High School in 1943, Rosemary was employed as a secretary for Otis Elevator Company and Princess Elkhorn Coal Company, both in Huntington. While living in Ironton, Ohio where her husband pastored Lorain Street Baptist Church, Rosemary worked for Ashland Oil & Refining Company. She also was employed at Kerr Glass Company as secretary for a year while her husband attended Southern Baptist Seminary in Louisville, Kentucky. In 1963, Rosemary moved to Connersville when her husband accepted a call to pastor First Baptist Church. She worked for four years at Dresser Industries, and in 1968 started working at Philco-Ford and its successors until her retirement in 1992. A faithful member of First Baptist Church of Connersville, Rosemary served as Sunday School Treasurer, sang in the choir, worked in Vacation Bible School and on many occasions served as pianist and organist for church services. Survivors include two sons, Kenneth Wayne (Brenda) Chandler and Brent Allen (Donna Lynn) Chandler, all of Connersville; nine grandchildren, Eric (Karen) Cornett of Connersville, Jeffrey Cornett of Beattyville, Kentucky, Dustin (Mai) Cornett of Beattyville, Jackie (J.P.) Benitez of Zionsville, Indiana, Becky (Justin) Combs of Noblesville, Indiana, Nick (Megan) Chandler of Carmel, Indiana, Brad (Lisa) Day, Chuck (Marci) Logan and Ryan Logan, all of Connersville; sixteen great-grandchildren; three great-great-grandchildren; a son-in-law, Ernie Cornett of Beattyville, Kentucky; three sisters-in-law; several nieces and nephews. Rosemary also leaves a former daughter-in-law, Connie Chandler, with whom she had remained very close during the years. Besides her husband of 52 years, Reverend Kenneth W. Chandler, Rosemary was preceded in death by her parents; a daughter, Donna Lorraine Cornett; four sisters, Madalyn Goodall who passed away at age six, Donna Coe, Phyllis Staley, Vancel Van Ness; two brothers, Brent Goodall and Vernon Goodall. Family and friends may call from 11:00 a.m. until the time of service at 1:00 p.m. on Saturday, February 2, 2019 at First Baptist Church of Connersville, 1211 N Grand Avenue, Connersville, Indiana. Reverend Mal Gibson will officiate. Burial will follow in Dale Cemetery. Miller, Moster, Robbins Funeral Home has been entrusted with the arrangements. Memorial contributions may be made to First Baptist Church Deacon’s Fund and online condolences may be made anytime at millermosterrobbins.com.